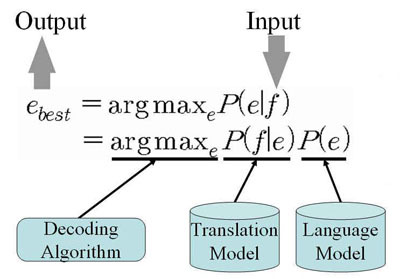 We have been developing the statistical machine translation system for speech to speech translation. We focus our research on text-to-text translation task now, but we will include speech-to-speech translation among our research topics soon. We have an interest in building a translation model, decoding a word graph and combining statistical machine translation system and speech recognizer. Input : SMT system gets a foreign sentence as a input. Language Model is a model that provides the probability of an arbitarary word sequence. 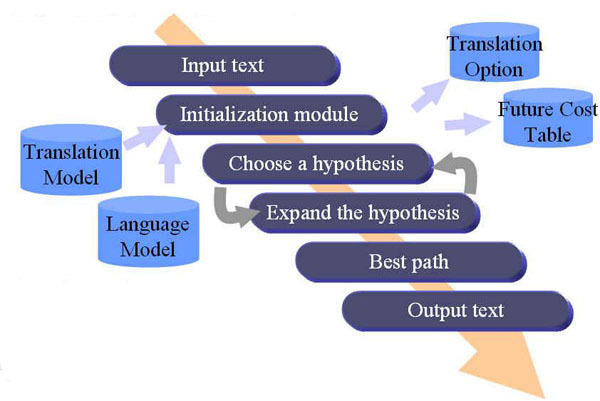 Translation Model is a model that provides the probabilities of possible translation pairs. Decoding Algorithm is a graph search algorithm that provides best path on a word graph. A Decoder is a core component of the SMT systzm. The decoder gets possible partial translations from the translation model, then selects an re-arranges them to make the best translation. Initialize : create small partial model for caching an pre-calculate future cost. Hypothesis is a partial translation which generated by applying a series of tranlation options. Decoding process is iterations of two taks: choosing a hypothesis and exapnding the hypothesis. The process terminates if there is no remainig hypothesis to expand. 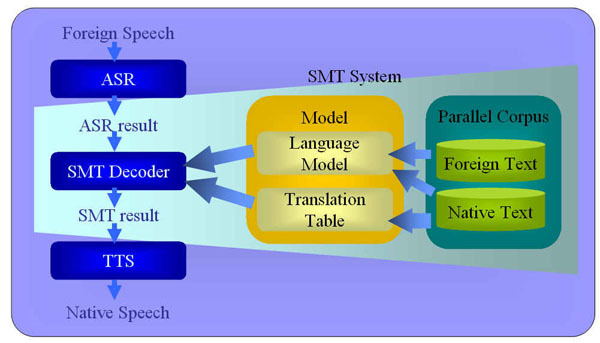 Speech to Speech Machine Translation can be achieved by cascading three independent components: ASR, SMT system and TTS system. That is, an output of ASR be an input for the SMT system and an output an output of the SMT system be an input for the TTS systm. We use cascading approach now, but we have an interest in joint model which combines ASR and SMT decoder.